↑ 1.0 1.1 1.2 William Grimes (1 October 2012). 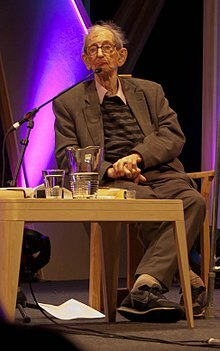 "Eric J. Hobsbawm, Marxist Historian, Dies at 95". The New York Times. Retrieved 4 October 2012. ↑ 2.0 2.1 2.2 2.3 2.4 Maya Jaggi (14 September 2002). "A question of faith". The Guardian. Retrieved 11 January 2012. ↑ Julia Hobsbawm (4 April 2005). "My Life In Media". The Independent. Retrieved 11 January 2012. ↑ "Author profile: Julia Hobsbawm". Atlantic Books. Retrieved 11 January 2012. ↑ 7.0 7.1 Ascherson, Neil (2 October 1994). "Profile: The age of Hobsbawm". The Independent on Sunday. Retrieved 24 May 2012. ↑ "Book of Members, 1780–2011: Chapter H" (PDF). American Academy of Arts and Sciences. p. 277. Retrieved 11 January 2012. ↑ "Eric Hobsbawm (1990): Nations and Nationalism since 1780 (excerpt)". The Nationalism Project. Retrieved 11 January 2012. ↑ Brad DeLong (9 March 2007) . "Low Marx: A Review of Eric Hobsbawm's Age of Extremes". DeLong's personal blog. Retrieved 11 January 2012. ↑ "Eric Hobsbawm Speaks on His New Memoir". UCLA International Institute. 29 January 2004. Retrieved 9 January 2012. ↑ Perry Anderson (3 October 2002). "The Age of EJH". London Review of Books. 24 (19). Retrieved 11 January 2012. ↑ Danny Yee. "Book Reviews: Eric Hobsbawm". DannyReviews.com. Retrieved 11 January 2012. ↑ "Author profile: Eric Hobsbawm". Random House. Retrieved 11 January 2012.